How our socialization of girls translates to an underrepresentation of women in Jazz. I frequently feel like I’m not enough. These self-sabotaging thoughts often make their way into my practice of music. On my latest album, Chasing the Unicorn (Posi-Tone Records), I recorded an original composition called “Never Enough”. As I sat down to write this particular tune, I kept stopping myself. A lightbulb would go on as the seedling of an idea, but as soon as I heard it, I would stop myself from cultivating it, thinking “that’s not good enough!” I decided to force myself to finish this tune, and make that tiny idea that “wasn’t enough” into something complete. When I came up with the title, it got me thinking about why I often feel like I’m not good enough, and how this deep-seated and far-reaching societal problem affects not only my own music and productivity, but our whole culture. Our society is telling us we are not pretty, skinny, fashionable, well-groomed, or blonde enough. Not tan enough or white enough, accessorized or toned enough. Not intelligent, organized, well-informed, well-read, politically aware, curious, self-aware, zen, or unique enough. We need a better car or house. We don’t wake up early enough, or get enough done in the day. We should be more feminine, better in bed, better friends/wives/daughters/mothers, more philanthropic. We need to eat healthier and take more steps. We should be making and saving more money, getting better jobs, and working to be more successful in our careers. We are too meek, or too forceful and bossy. We should be more agreeable and selfless. Strangers ask us if we want “more” in life, meaning, “when will you have kids”, and “don’t wait too long”. We are not assertive enough, but sometimes too aggressive. We are too young to be taken seriously, or too old to be relevant. We are told to be more confident and be proud of ourselves, but not too egotistical. Society wants us to be everything, all the time. Society wants us to be perfect. This extreme pressure to fit into the feminine social mold begins at an early age, when girls are taught to take care of others before taking care of themselves. As children, girls are encouraged to play house, be the “mom”, and tote around dolls and babies. She has tea parties, fixes lunches and sets the table, plays in her kitchen, and cleans up with her toy vacuum. She is also training, as she is expected to participate in these household chores and tasks within real family life as she grows older. Girls are expected to take up very little space – physical, emotional, and mental. “Be seen but not heard,” “felt but not noticed”. Girls are supposed to do things behind the scenes, without expecting acknowledgment or reward for their good behaviors. In fact, it’s been proven that often times, men and boys get the credit for women’s and girls’ ideas and successes. Girls are taught to prioritize others before themselves. They are taught to always think of how to please others, make others feel comfortable, and at all other costs – be pleasant. Boys, on the other hand, are busy practicing: practicing independence; practicing their freedom of speech; practicing sports, which benefits hand-eye coordination, physical skill and strength, cooperation, leadership, organization, healthy competition, and good sportsmanship. “Boys will be boys!” Their hyper nature and physical activity are encouraged and accepted. Boys are practicing video games, exercising their imagination and problem solving skills; practicing building things, learning how to execute an idea from start to completion and stretching their critical thinking; practicing focus – on what they want, and how to get it. They are learning what they are good at, and how to demonstrate those skills to others. Boys are taught the power of discipline, and how if they stick to an idea, they can achieve results. They are rewarded for their creativity in projects, for thinking outside the box. Whether in the garage with their father working on cars, or at their father’s office in adolescence, interning for the family business – boys are practicing hands-on life skills, and making mistakes from an early age. Boys are taught to expect applause, congratulations, and encouragement not only for accomplishments, successes, and wins, but simply for their effort – even if it results in failure. With all of the external expectations for girls to fit into a female mold that society has engrained into us, it is no surprise that many girls and women become perfectionists, (and/or self-destructive). Girls are trying to be something in particular – society has told us there is a “right” way to be. And often, this way of being doesn’t align with a girls’ true nature. Often, this expectation is stifling and results in an immense amount of pressure. Because often, when girls have tried to go up against these expectations, she has been violently punished or reprimanded for her disobedience, independence, assertiveness, intelligence, feistiness, aggressive nature, individuality, or – worst of all – “un-lady-like behavior”. As a result, many of us are afraid to try anything new, anything we are not sure we “should be doing”, or anything we aren’t certain we can get right on the first try. When I was five years old, I attended a public Montessori school. I was in the lowest of three grades mixed into one classroom. In the Montessori program, the child sets their own pace, and chooses what to work on. It’s very creative, and hands-on. The problem with this system, however, is that the child determines their own challenge level and pace. My parents became aware that I might need more of a rigorous academic situation. They decided that I should apply for an accelerated program called APP – Advanced Placement Program. APP worked two years ahead academically, but also focused on different types of learning skills, including creative problem solving and critical thinking. There was a standardized test to get into the program, and I didn’t score anywhere close to the cutoff for acceptance. In particular, my language scores were way below my math scores. My mom confronted my teacher and said “This can’t be right – I know my daughter is smarter than this, and her language skills are typically her strength.” And my teacher said, “No, she really isn’t, this seems right. She’s only reading these easy books in class”. My mom explained to her that I was actually reading much harder chapter books at home. So, my mom took me to a private testing facility. The proctor pulled her aside after the test and told her, “She knows all of the right answers, once I can get them out of her. But she won’t even try to answer if she isn’t 100% certain she knows it”. It turns out, I had left a ton of questions blank on the initial exam! This is a funny anecdote now, but I think it is a great example of how many girls (from such a young age!) are feeling an extreme pressure to be perfect. And this perfectionism is preventing girls from trying. Which makes me wonder, how does this fear of failure prevent girls from getting the attention and education they deserve? What other opportunities does this phenomena prevent us from experiencing? What could women be contributing to society if they felt safe to try, and encouraged to participate? I want to point out that my teacher was perfectly fine with me maintaining a minimal academic level in the classroom. As long as I didn’t speak up and cause trouble, I could keep my slow pace. To her benefit, she probably just didn’t realize my capacity, (because she never asked). Additionally, if I didn’t come from such an educated, assertive, and supportive family, I would have never received the tools I needed to thrive. Without my parents’ pushing and asking for more for their child, I would have stayed in an environment where I was allowed to fall through the cracks. I am extremely fortunate and privileged to come from this family. What does this all mean within the context of the Jazz world? These concepts and their consequences can be explored universally in our society, but in Jazz, I can attest that they are not only directly translated, but highlighted and exaggerated within the community. As girls get older, they quit jazz band. If you look at a very young jazz program these days (elementary-middle school), there is a pretty good representation of girls. But as the kids get older, and you look at high school programs, colleges, and into professional careers, that ratio of young women to their male counterparts only gets smaller as age increases. Female musicians quit, more and more, as they “grow up”. Why is this? This problem is very complex, but the ingrained socialization of girls and their resulting desire to be perfect is one huge reason that many girls and women may feel they don’t fit in within the jazz community, they cannot succeed in the jazz world musically or in their career, and/or they simply never had an opportunity to fully try to pursue jazz. In our current education system, students typically start learning an instrument some time between 4th and 6th grades. Also around 6th grade, jazz programs become available for students in many middle school programs. By high school, most kids are expected to solo, and are usually improvising at a beginning to intermediate level. By college, improvisation becomes the main focus of jazz education. The problem with all of this, is that soloing and improvisation require you to be bad at something. It is a skill that requires you to make things up. It requires you to synthesize ideas on the spot. It requires you to assert yourself, make yourself the center of attention, command attention from your bandmates and audience; step outside the box. And when you first start improvising, you are not any good at it! Think back to early childhood, when girls are supposed to learn how to do things “properly,” while boys are encouraged to “explore”, and “create”; while girls follow orders, boys make up their own rules. Now imagine me at age five, afraid to say anything that I’m not 100% certain is “perfect” or “correct”! How is that young girl going to learn how to improvise? When is she going to practice the skills required to master this extremely involved art form? How will she be brave enough to try soloing in front of her peers, let alone an audience, when she has been told she must be perfect at all times? She has been told to be quiet, meek, pleasing, appeasing, and supportive. She has been told her voice isn’t important. Where does this type of socialization of our young girls leave females in Jazz? There is no room for girls in the band room, if she follows social norms. And, as she grows older and into puberty and it becomes ever more apparent to her teachers that she is a “young lady”, or a “young woman,” how is she treated more extremely as such? As it becomes more apparent to her that she wants to be accepted and treated as a “likeable” female, how does she change her own actions, personality, and behaviors to match the external expectations she faces? 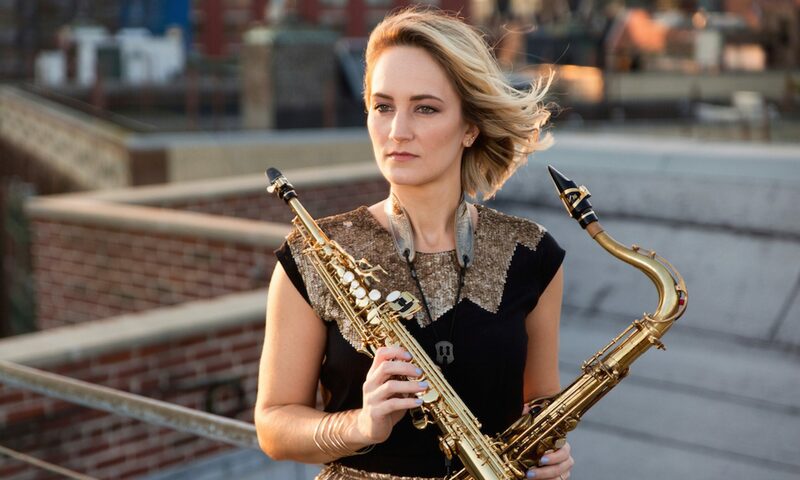 How many women have quit playing Jazz at some point in their life because they didn’t feel comfortable going against everything they have been taught they are supposed to be? We already know that girls are less likely to speak up in classrooms. This is also true in office environments – women speak up less than their male counterparts at work. Additionally, it has been shown that the more females are in a room, the more likely a female is to speak up. (The less women, the less likely). The tipping point is 33% – when a third or more people in a room are female, they start to feel comfortable to speak up, their voices start to be heard, and their thoughts represented (this goes for other marginalized groups as well). (Check out Feminist Fight Club by Jessica Bennett). Now imagine a typical band room full of boys, or a typical stage or bandstand full of men. Imagine a girl or woman there in the mix, and how she will be less likely to share her musical voice when there are literally no other girls or women in the room or on the stage. This cycle perpetuates itself, since Jazz has remained dominated by males. So, within a jazz music culture where it is all about the individual voice, the courage to stand up and play a solo, and take a leap of faith to express your ideas without being afraid to be “wrong” or make mistakes, where does this leave girls and women, who are socialized to be silent, submissive and obedient? 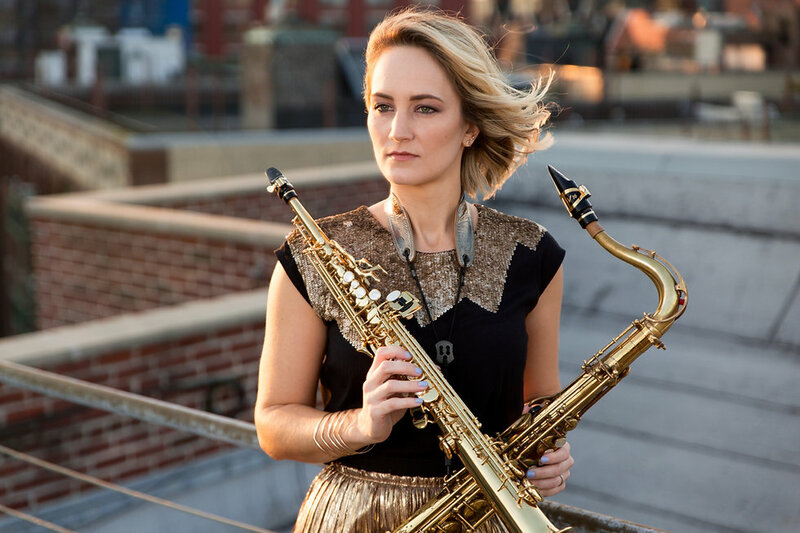 How does a girl find her voice in Jazz, when she isn’t encouraged to speak loudly, aggressively, or to challenge her male peers? How is she supposed to hone her skills, or become first chair in band, when she is conditioned to step back and let boys take the lead? How is she supposed to sound strong sight-reading a piece of music for the first time, in front of her peers, when she isn’t 100% sure she will get the right notes or rhythms? Jazz is the American Art Form. Jazz is a Democracy. Everyone is supposed to have a voice in Jazz. Jazz is a language, where everyone interacts and speaks up. Jazz is an artform where individuality and the individual is celebrated. Jazz musicians must exhibit strong leadership skills. Jazz is improvisation, encourages “imperfection” and creativity. Jazz is the ultimate expressive music. Do any of these Jazz values sound like qualities that we encourage our young girls and young women to exhibit and explore? I remember feeling guilty for not liking dolls. I have also been terribly hard on myself with improv. I have a jazz class for girls called Sonoma Jazz Girlz so that they won’t be less than 1/3 of their class or hear any mansplaining. I don’t care what anyone says; it’s necessary. Thanks for sharing! That’s wonderful that you have a jazz class for girls. For now, I think this is a great way to help work on the problem. In addition to giving those girls an opportunity to play and improvise, they also get a better chance at being themselves when they aren’t the token girl in an experience! Great post! I will share. Thanks Roxy!